Afternoon tea is one of my favourite things. Little finger sandwiches (which always taste better than regular-sized sandwiches), scones, cakes, tea and maybe even a cheeky glass of bubbles…what’s not to like??! Hotel Cromwell in Stevenage Old Town invited us to try their ‘Festive Afternoon Tea’ which is available to book from 1st December. We swiftly booked in Nana to entertain the boy so that hubby and I could enjoy a couple of hours to ourselves. There’s something about afternoon tea that makes me feel a bit fancy, so I even wore a dress. To be honest, it felt quite nice to make a bit of an effort…maybe I should do it more often! Hotel Cromwell is located on the High Street in Stevenage Old Town and, back in the day, was the farmhouse home to Oliver Cromwell’s secretary, John Thurloe. Although the hotel was recently refurbished, it is still full of character with unique, stylish decor and quirky touches. The atmosphere is comfortable and relaxed, and it’s a lovely place to spend an afternoon. There is also a private car park at the back of the hotel, which is really handy as the High Street can get very busy. Our Festive Afternoon Tea took place in the lounge area of the hotel, which has a very relaxed vibe. Our table for two was laid out nicely, with a proper tablecloth and napkins, and even a couple of Christmas crackers which was a nice touch. The chairs were plush and very comfortable. If you have a bigger party, there is an alcove which can seat up to ten around a table. We were offered drinks on arrival – we had tea, a jug of water and a glass of Prosecco. The Prosecco costs £5 extra but it was a very large glass and it was also very delicious, so well worth it in my opinion! Shortly after, the food arrived on a traditional three-tiered platter. My eyes are bigger than my tummy and I always think that afternoon tea doesn’t look like enough food when it comes out. However, I ended up getting really full. It was actually plenty! The food was very tasty. Our favourites were the mushroom and stilton tart (which was served warm), the scones (these were really big, absolutely delicious and came with plenty of clotted cream and jam), and the chocolate and orange millionaire shortbread. Our waiter was friendly and attentive – nothing was too much trouble. We had a fab afternoon. It felt really special and it was lovely to spend some quality time with the hubby. It’s important to have some time together to try and keep the magic alive! We felt very chilled out at our Festive Afternoon Tea at Hotel Cromwell and spent about two hours enjoying the food and drink. We could easily have spent another couple of hours there, lounging in the comfy chairs! 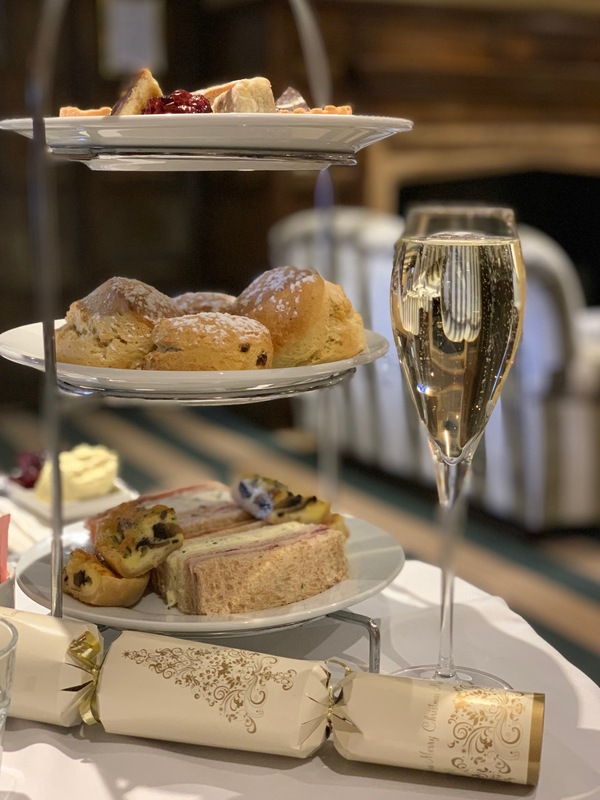 Festive Afternoon Tea at Hotel Cromwell costs £16 per person (£21 with a glass of Prosecco) and £7 for children under 16. Booking is essential, as everything is made fresh on the day. Contact details are on the Hotel Cromwell website. The hotel offers its regular Afternoon Tea all year round, and is very popular for baby showers and hen dos. Overall, I highly recommend a visit. It’s perfect for a date with your partner, or an afternoon out with your best girls. Disclaimer: Mums Off Duty received a complimentary Festive Afternoon Tea for two, for the purpose of review. My reviews are always completely honest.